Armagnac is perhaps the most wine-like of spirits, and so it makes sense that, at Vinous, we begin our foray into the high-proof world of liquor by looking deeply into this classic brandy from Gascony. The profiles of 24 top producers as well as the tasting notes and ratings on about 80 bottles found here represent perhaps the most comprehensive guide to Armagnac available outside of reference books. Why start with Armagnac? I’m one of the few critics who’s written extensively on both wine and spirits, publishing books on both over the past decade. I’ve always viewed Armagnac as existing on common ground for enthusiasts of both. Surely, Scotch and bourbon have their legions of aficionados and collectors. Yet when I see whiskey prices these days, I have to scratch my head at the insanity. It’s not just the coveted Islay single malts selling for over $1,000 or the fact that a bottle of 20-year-old Pappy Van Winkle cracks the $2,000 threshold. Run-of-the-mill bottles of ten- to 15-year-old bourbons, ryes, and Irish whiskeys now regularly sail north of $100, many north of $200. When I see an 18-year-old rye selling for $450, or a bottling of Dewar’s (Dewar’s!) with a price tag of $499, I know the madness has taken over. So, in this report, I’m suggesting we look elsewhere for brown-spirits value. If you’re the sort of person who enjoys bourbon or rye or even Scotch, there’s never been a better moment to give Armagnac a try. Producers are using older and older brandies in their blends, creating great spirits that offer notable complexity and value. New regulations, released in April by the BNIA (Bureau National Interprofessionnel de l'Armagnac) have streamlined the age categories, making the spirit slightly easier to understand. Still, Armagnac remains a bit of a mystery in the English-speaking world, for various reasons. First, you cannot tiptoe around a basic fact: Ours is not a brandy-drinking culture. When people talk about brandy, a famous line from Samuel Johnson is often quoted: “Claret is the liquor for boys; port for men; but he who aspires to be a hero must drink brandy.” By Dr. Johnson’s definition, America is fairly lacking in heroism. Sadly, those who dismiss brandy miss out on unimaginably delicious nectars full of history and craftsmanship. Some of it is lack of education or awareness. I used to teach a class on fine French brandies at a wine school in Philadelphia. I always began with a simple question: Can anyone define brandy for me? Usually, I was met with blank stares. And so I would start at the beginning: Brandy is a spirit distilled from fermented fruit, rather than fermented grains. That fermented fruit can be grapes (i.e. wine), or it can be apples, pears, cherries, peaches, plums, raspberries or – in the case of some inventive distillers – Asian pears, quince, or the buds from Douglas fir trees. The two most coveted brandies in the world, Cognac and Armagnac, begin life as wine. Brandy also suffers from a general image problem. It conjures up clichés of old men in smoking jackets, lounging with a pipe by the fire, surrounded by old books, sipping from a snifter – ironically, the worst glass in which to consume brandy (more on that later). Most of that reputation comes from Armagnac’s flashier cousin, Cognac, with the bigger houses there promoting a bling-bling world of crystal decanters and celebrity endorsements. Armagnac exists in a different world. 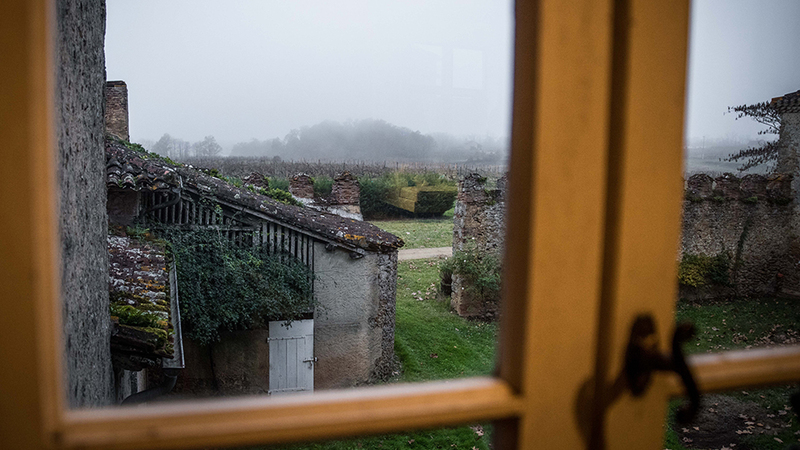 Gascony is a humbler land of foie gras and confit, where ducks and geese outnumber people. The place is notoriously quirky, provincial and ornery, without big train stations or super-highways to make travel easy. A little over six million bottles of Armagnac are produced worldwide each year, with less than a half million reaching our shores. France is still Armagnac’s top market, followed by the UK, U.S., Russia, and China. Armagnac’s total production is a drop in the bucket compared with Cognac, which annually sells 160 million bottles worldwide. Perhaps this is why Armagnac is often referred to as Cognac’s “hick cousin.” Some might also say that Armagnac is to Cognac as the wines of Southwest France are to Bordeaux. This isn’t entirely accurate, and Gascons bristle at notions like this, but Armagnac does bring a more rustic, robust, burly character to the glass. While it can have amazing finesse and elegance, it is an affable, gregarious spirit. What Armagnac also possesses is authenticity, history and tradition. It dates back more than 700 years – predating Cognac by a couple hundred years – making it one of the world’s oldest distilled spirits. The reason I say that Armagnac is the most wine-like of spirits, is that – unlike most spirits – factors like terroir and grape variety significantly impact what’s in the bottle. Armagnac consists of more than 500 grower-producers, and 300 growers that sell to one of six cooperatives or 40 négociant houses. The AOC is split into three sub-regions: Bas-Armagnac, Ténarèze, and Haut-Armagnac. There is also a separate AOC for Blanche Armagnac, an unaged eau de vie, which was created in 2005 as an effort to reach a cocktail/mixology audience. For our purposes here, we’ll be dealing with the aged Armagnac as a neat spirit. 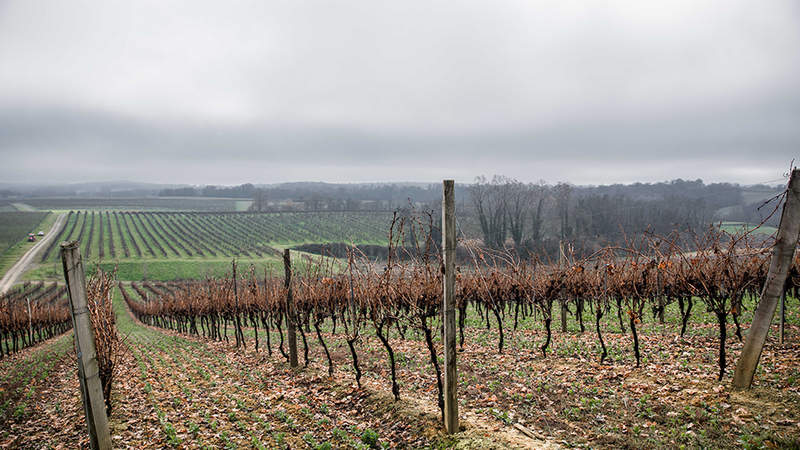 Bas-Armagnac, whose capital is Eauze, accounts for 57% of the AOC’s vineyards, planted in its sandy, silty soils. The villages of Labastide d’Armagnac, Arthez d’Armagnac, Le Frêche, Villeneuve de Marsan, Le Bourdalat, Lacquy, Perquie, Hontanx, and Mauléon d’Armagnac, with their especially iron-rich sables fauves soils, comprise the bullseye area that was once “Grand Bas-Armagnac” or the “Golden Triangle,” which many believe produces the finest brandy in the entire appellation. There are so many great producers in Bas-Armagnac, but some of the most highly-regarded are Domaine Boingnères, Dartigalongue, Delord, Castarède, and Chateau de Laubade. Ténarèze, whose central town is Condom, contributes 40% of the production, though is much less known outside of France. With its pure, earthy, mineral-driven brandies coming from clay and limestone soils, Ténarèze is beloved by many enthusiasts. Top Ténarèze producers include Chateau de Léberon and Domaine d’Aurensan. Lastly, there is Haut-Armagnac, which produces only three percent of Armagnac’s total production. Still, enthusiasts seek out these unique brandies from this easternmost sub-region, nicknamed “White Armagnac” because of its cool, limestone soil. Château Arton is perhaps the best-known Haut-Armagnac producer. Besides terroir, the grape varieties utilized in the distillate are extremely important. Ten grapes are officially allowed, but in practice only four are used in the vast majority of Armagnac: Ugni Blanc, Colombard, Folle Blanche and Baco. For those who know Cognac, the first three of these grapes should be familiar, though it’s more common in Armagnac to see bottlings of 100% Folle Blanche, which brings bright, pretty floral notes in youth, and deep, rich, spicy tobacco notes as it ages. A key difference between Cognac and Armagnac, however, is the use of Baco. A hybrid of Folle Blanche and the North American grape Noah, Baco was created in the late 19th century to withstand the phylloxera plague (the technical name is Baco 22A, but everyone just calls it Baco). 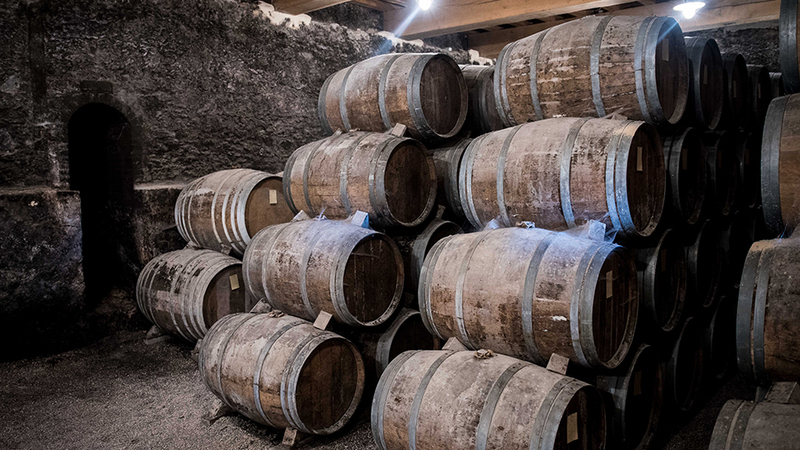 For most of the 20th century, Baco has been the secret backbone upon which long-aged Armagnac rests. One importer called it “the American muscle car of grapes” that can handle decades of oak. But in the 21st century, the hybrid origin of Baco caused some consternation among European wine growers, and in 2010, the European Union tried to ban Baco. 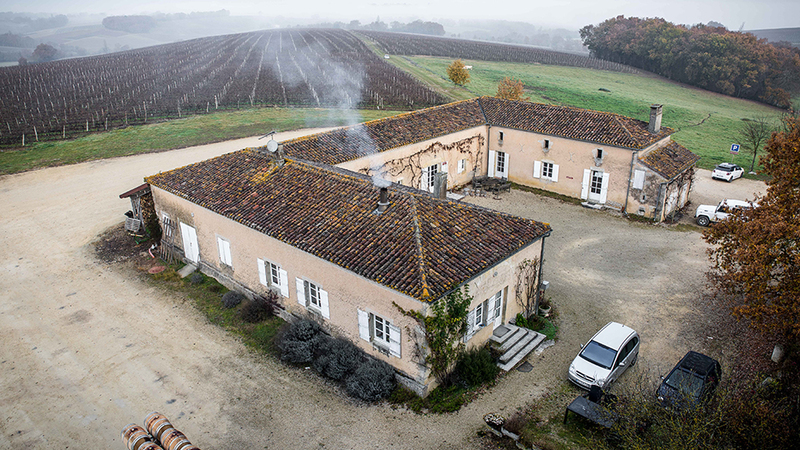 A heated legal battle took place, with Armagnac producers doggedly fighting for Baco’s legitimacy. Finally, a group of influential French sommeliers lobbied on behalf of the grape, and the issue was resolved. Baco would be the only hybrid grape permitted in a European appellation. Baco is particularly suited to Bas-Armagnac, and is less prevalent in the other two sub-regions. One curious by-product of the Baco controversy is that a number of producers – worried that Baco would be banned – began experimenting with some of the other approved-but-forgotten “ghost” grapes. One of these is Plant de Graisse, which the large producer of Château de Tariquet now uses in some of their top blends. Of course, distillation and aging are equally important factors in producing great brandy. 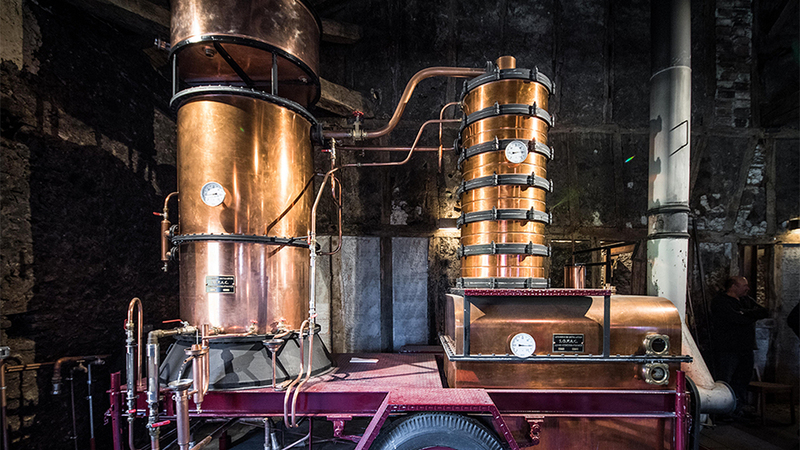 About 95% of Armagnac is single-distilled in column stills that run continuously at low temperatures. This is a contrast to Cognac, where double distillation in pot stills is the norm. 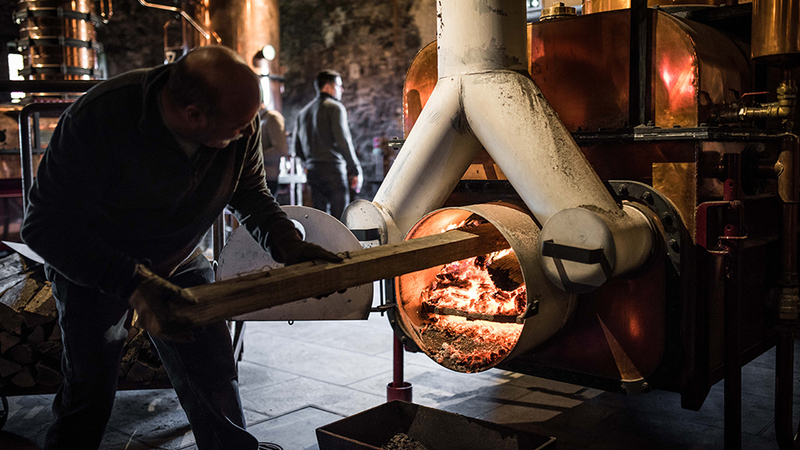 Single distillation means less of Armagnac’s natural compounds are stripped out, creating a more boisterous, rustic brandy – “more character” as the cliché goes. Many smaller estates don’t even own stills, and rely on roving distillers arriving at their property during the late fall. In fact, the grape harvest is barely over when the distilling season in Armagnac kicks off, running from late October through early January, often happening around the clock. This is a wonderfully festive time, referred to as the “Flame of Armagnac,” named after the instrument used to light the still. At night, during these weeks, distillers dine, play cards, smoke cigars, and even throw all-night parties right next to their piping hot stills, which in many cases are still fueled by wood. I’ve been to these soirées occasionally and eaten so much Gascon foie gras that I feared I might meet the same fate as the geese. Armagnac, of course, helped wash it all down. After the festivity of the distilling season, the eau de vie finally goes into barrels, where it will quietly reside for many years or decades. This final piece of the Armagnac equation – age – determines quality perhaps more than any other factor. For the most part, the brandies will generally begin maturing in medium-toast barrels. Baco or Ugni Blanc often spend more time in new oak, while Folle Blanche and Colombard will generally see less new oak. In any case, by two years old, most of the brandy has been moved to used, neutral barrels for what might be decades more aging. 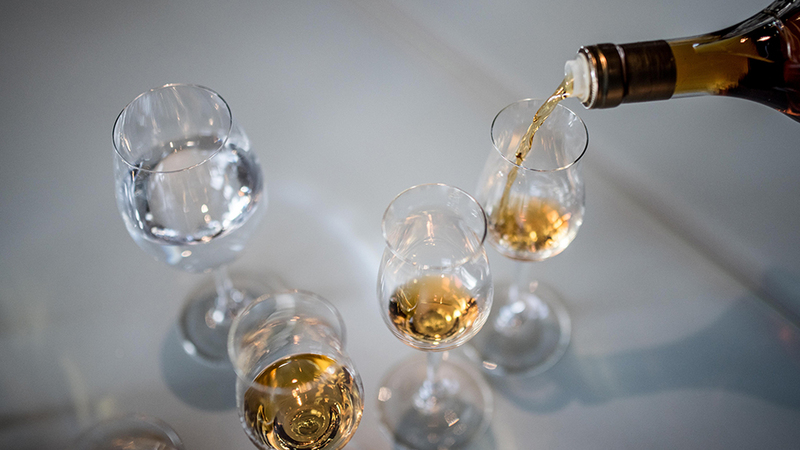 Traditionally, the brandies for blends are brought down to around 40% alcohol by volume, while the vintages were often bottled as cask-strength, at higher proof. These days, however, there is an overall trend toward more cask-strength offerings. To be clear, fine brandies are made at all proofs (the whole “cask-strength is better” fallacy has been foisted on us by a vocal minority of whiskey geeks). Because aging practices are all over the map, age classification is the source of most consumer confusion. 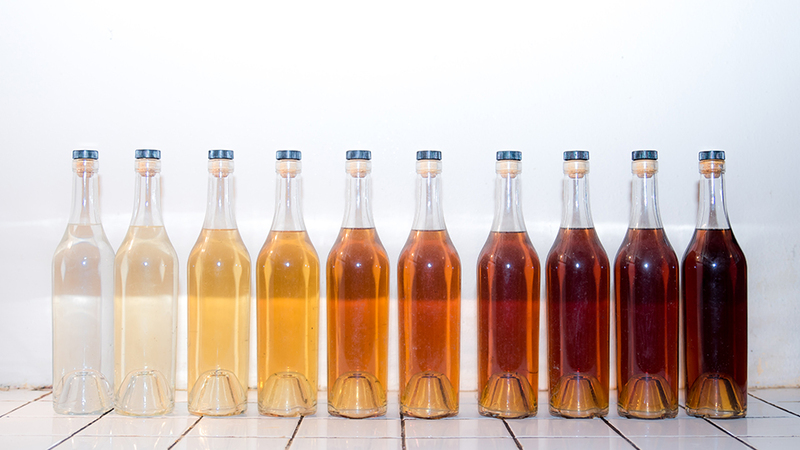 Most brandies will be blended into various bottlings with an alphabet soup of classifications – VS, VSOP, XO – as well as alternative names of Hors d’Age and Napoléon. New rules released in April 2018 define the following: VS, one to three years old; VSOP, four to nine years old; Napoléon, six to nine years old. More significantly, the minimum age of XO was raised from six years to older than ten years – this to reflect the reality that most estate’s XOs have never been released younger than ten years old. Still adding a little bit of confusion is the name Hors d’Age, which also has a minimum age of more than 10 years. What’s the difference, then, between XO and Hors d’Age? “It’s semantics,” says May Matta-Aliah, an official Armagnac educator for the BNIA in New York. In any case, I’ve found estates that bottle both XO and Hors d’Age tend to put the older brandies in their Hors d’Age, which end up being more expensive. But even that rule of thumb varies. Ages and blends are all over the map in Armagnac. There are XOs that may have 20-year-old brandies in the blend, and others where all the brandies in the blend are just a smidge older than ten years. There are, however, a few personal truths that I’ve come to understand over years of tasting Armagnac. First: Fine Armagnac demands age; there are very few below-XO-level brandies that I’d recommend, simply because they’re not mature enough. A few excellent younger offerings within my tasting notes include Chateau Arton’s “La Reserve” (four to eleven years old), Chateau de Lacquy VSOP (seven years old), Domaine d’Esperance 5-Year, and Domaine Boingnères Reserve Speciale (five to ten years old). But all four of these are as expensive as most XO or Hors d’Age, at $70, $65, $55, and $115 respectively. At the XO and Hors d’Age level, there are numerous bottles that command attention and offer good value – including Delord XO, Dartigalongue XO, and Cyrano XO at around $55, Château de Briat Hors d’Age at around $70, and Baron de Lustrac XO and Château de Laubade XO at around $80, to name a few. But what I have found over time is that Armagnac really begins to hit its stride after 20-plus years in the barrel, and my favorite blends, such as Dartigalongue’s Grand Eau-de-Vie, Castarède Réserve de la Famille, or Delord 25 Ans d’Age all have at least two-decade-old brandies in the mix. When Armagnac gets even older, we begin to experience the odd, hard-to-describe flavors of rancio – variously described as old varnish, bitter walnut, sharp cheese, or even umami notes like soy sauce – which aficionados covet and seek out. While you can occasionally find rancio at 20 or 25 years, it’s mostly experienced in longer-aged brandies. When we talk about the longest-aged Armagnac, we’re generally talking about vintages. By the regulations, vintages only have to be older than 10 years. But most of the best vintages may be anywhere from 30 to 50 years old. The only way to know the age of a vintage is to know when it is bottled. That is because, except in highly unusual cases, spirits stop evolving once they’re bottled. As such, a 1972 Armagnac bottled in 1992 is a younger Armagnac than a 1980 Armagnac bottled in 2018. It is for this same reason that drinking windows are not applicable when writing about spirits. A bottle tasted now should be identical to a bottle tasted in a decade or more. 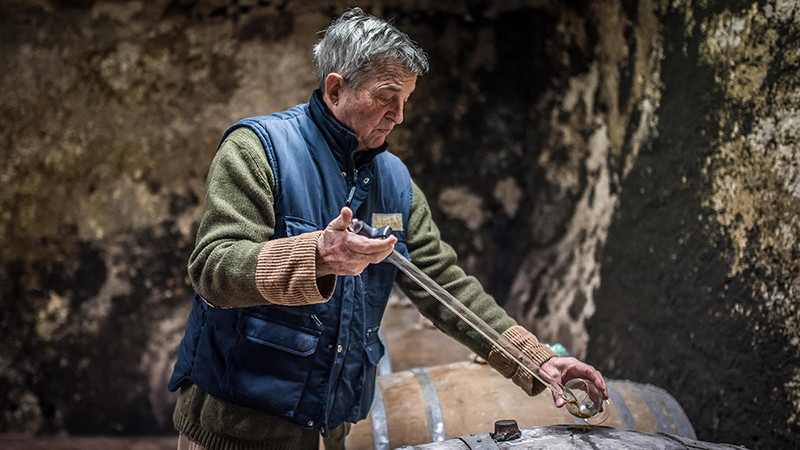 One tradition in Armagnac is the treasure-hunting négociant who roams the region, seeking out prized single-barrel brandies, hidden in the cellars of small farms and estates. Many of these estates may have only produced barrels during a precious few vintages. Take some time to read the tasting notes on the fascinating vintages by Darroze, Baron de Lustrac, and L’Encantada, who always label their bottles with the estate of origin — as any quality négociant who bottles single-estate brandy should. Finally, a closing note on glassware – namely, the stereotypical snifter that people associate with brandy sipping (and smoking jackets and old men). In short, if you’re going to invest in fine Armagnac, get rid of your old brandy snifter immediately. The snifter is, perhaps ironically, the worst glass to enjoy brandy in. Snifters concentrate the alcohol and simply cause a hot burn on the nose and palate. Always use a tulip-shaped glass with your Armagnac. Tasting spirits is not like tasting wines. First, there is the obvious issue of alcohol by volume, and the high-proof nature of spirits means that the palate can only handle a smaller number of tastings in a single day. And so the tastings for this report necessarily happened over a number of weeks, with subsequent re-tastings whenever possible. Spirits also present more complex issues of aging and price than wines do. Each house has its own formula for aging, blending, and releasing vintages. While Armagnac has rules, those rules allow producers to create a multitude of bottlings, all of them with slight or great differences. I tried, as much as possible, to group similar-aged spirits in my flights: tasting flights of XOs, or younger blends, or 20+ year ‘special reserve’ blends; flights of vintages from the 1990s or 1970s; flights of single-varietal bottlings. Prices also present a tricky situation. In my report, I review XOs that range from $50 to over $120. There are 8-year-old brandies as low as $35 and bottles with brandies as young as four years selling for $70. There are 30-plus year-old vintages selling for just over $100 and others selling for $400, or more. A point to remember: all a vintage in Armagnac means is that the liquid came from that one harvest and has more than 10 years of aging. A vintage can be released ten years and a day, or 50+ years hence. Maybe a house decided to release all of its 1980s stock in the mid 2000s because they felt it was time. And so that 1988 vintage was sold in 2008 as a 20-year-old. Another house may have held its 1988 in barrel and is releasing it now as a 30 year old. Those would be two totally different products from the same vintage, with a difference of a decade more aging. And presumably the 30-year-old 1988 would be around $300, while the one released in 2008 might be closer to $150. In all, I tried my best to score based on performance within these sometimes nebulous age categories. My highest scoring XOs were judged against other XOs, and vintages against vintages of similar age. Armagnacs that achieve 95 points or above are highly elevated in their sophistication, always complex, always compelling. Those that achieve 91 and above are still excellent examples, with many good values to be found. Between 85 and 90 are solid bottlings that provide enjoyable drinking. It should also be noted that the Armagnacs reviewed here constitute a largely comprehensive universe of those available in the United States. This raises two points of note on the high quality of Armagnac and the resulting scores. First, as Armagnac remains a niche product, those imported into the United States tend to be the reference points, the overachievers. Second, since Armagnac is made over many years and is stable once bottled, this means that producers can bide their time to make their best possible product. It's a bit like if all the top Barolo, Burgundy or Napa Valley producers were able to freeze in time their greatest ever wines and then bring them to market at one time. Together, these points are another reason why reviewing spirits is a little different than reviewing wine. In the end, what came across most profoundly is the excellent quality and value that Armagnac exhibited across the board. So why don’t more drinkers seek out these exquisite joys? I could blame any number of factors, but the biggest issue is a lack of consumer education. For that, I point my finger at both sommeliers and bartenders/mixologists, who too often work in silos. In general, sommeliers need much more spirits education and those behind the bar too often lack an understanding of wine. Somewhere between the wine list and cocktail menu lies the potential for a selection of brandies and other fine spirits, taken neat. Armagnac is the perfect vehicle for this collaboration, a coming together of wine and spirits enthusiasts. One of the world's preeminent experts on spirits, Jason Wilson is the author of two books, the recently published Godforsaken Grapes: A Slightly Tipsy Journey through the World of Strange, Obscure, and Underappreciated Wine and Boozehound: On The Trail of the Rare, the Obscure, and the Overrated in Spirits. His articles have appeared in a diverse range of publications, including the New York Times, Washington Post, New Yorker, AFAR, Preservation, Boston Globe, Conde Nast Traveler, Harpers Wine & Spirits, National Geographic Traveler, Philadelphia Magazine, Philadelphia Daily News, Travel & Leisure, Salon, Town & Country, Outside, Whisky Advocate, and the Washington Post’s Sunday Magazine.